food history – she eats. If this redesign doesn’t smack of desperation, I don’t know what does. 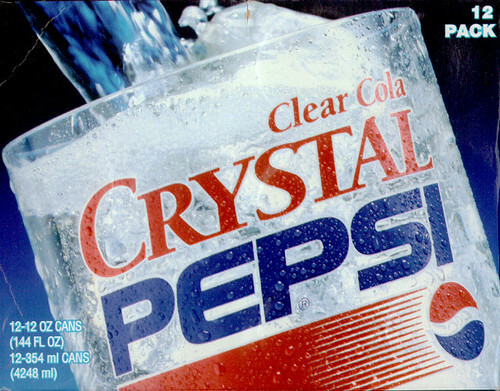 Wherefore art thou, Crystal Pepsi? Tuesday Trivia: Part Holy Crap It’s Back! Last night was spent at Del Frisco’s with the lovely Jenny of I’m Never Full (and now Citysearch! ), attending the check presentation party to wrap up Houston Restaurant Week, which you can read all about here: Y’all Raised $78,877! Needless to say, that was pretty awesome. Chicory is well-known as a coffee substitute. What common nut was also used throughout American history to make coffee when no coffee beans were available? Although we may view it as an all-American beverage, lemonade has actually been a popular drink since medieval times. Where was it first served and enjoyed? Diet sodas were introduced in the 1950s as a way of marketing artificial sweeteners to the general public. What company patented the first diet soda? Most species of domesticated livestock have been milked — and the milk enjoyed by humans — at some point or another in history. But which of these animals has not been used as a source of milk? Yaks, donkeys, horses or pigs? BONUS: In Western culture, the milk of what animal was favored over the cow until the 16th century? Posted on September 30, 2008 September 30, 2008 Categories beer and wine, food history, Houstonist, trivia8 Comments on Tuesday Trivia: Part Holy Crap It’s Back! If you’re a native Houstonian, you ate at Luby’s as a kid. Most of us ate there after church on Sundays, after a recital at school, before seeing a movie at the four-plex cinema down the road or just as a special treat to get out of the house. But the Jell-O remains, in all its jiggly splendor. At the beginning of the serving line, just after you’ve collected your tray, you face opaque lime-green squares, consorting unrepentantly with leafier, more virtuous salads. Looking at that Jell-O, you know exactly where you are. Even to this day, when I’m sick or feeling down, I ask for those three items from Luby’s: mac and cheese, fried okra and green Jell-O. Just ask my poor husband, who makes the trek out to their To-Go window. There’s something massively comforting about Luby’s. I don’t know if it’s the consistency of the food and the decor in their cavernous dining rooms, the sweet memories of childhood or the fact that you’re usually surrounded by cute little old ladies who look like your grandma, but Luby’s will never get old for me. And I will never get too old for Luby’s. After all, you have to love a restaurant which has lent the name of its most popular dish to a character on that pinnacle and paradigm of Texas culture: King of the Hill.